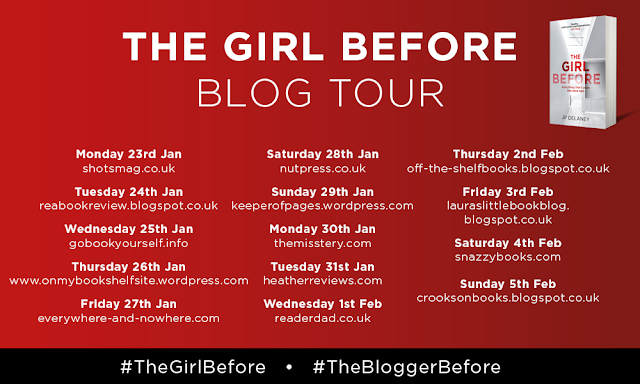 Today on Laura's little book blog, it is my stop on the tour for The Girl Before by J.P. Delaney. The blogger before me was Victoria from off-the-shelfbooks.blogspot.co.uk . I am delighted to get to share my review of this gripping book with you as part of the tour. The Girl Before was a book that I just could not wait to read. I had seen the trailer for it a few months back and it gave me goosebumps, so I went in with pretty high expectations. Told in two different narratives- Emma the girl before and present day Jane. Both have been through a trauma and looking for somewhere else to live. With rent sky high, choice is limited until they are both told about One Folgate Street. It is perfect, a minimalist house designed by the enigmatic architect Edward Monkford, but it comes with rules, 200 to be exact. When Jane moves in, she starts to find out more about Emma, the girl before her and her mysterious death and starts to wonder if her life is starting to mirror Emma's. Th Girl Before is a hugely intriguing read and one that effortlessly compels you to read on. The split narratives between Emma and Jane keep up the fast pace. It quickly became one of those novels that you just have to keep on reading; just one more chapter becomes you've read the whole book. I just had to find out what had happened to Emma. What is so jaw dropping about The Girl Before is that no one is quite who they first appear, very much alluding to that Gone Girl vibe. This is what made it the psychological thriller that it was. The author cleverly misdirects you and starts to make you question who you should really trust as you realise that each character may be just as twisted as the other. I also liked the way that despite the different timelines, Emma and Jane's stories mirrored each other's. From the moment they are both in search of a new place to live, to that climax, it definitely gives you that girl before sense that the book is trying to convey. The only slight bugbear that I have is that the very very end of the book fell a little bit flat, I was expecting something a little bit more. Highly intriguing and compelling, The Girl Before is hard to put down. The next blogger on the tour is Laura from www.snazzybooks.com.